Week 6 | Fox Walkers at Whatcom | Hazard Awareness, Forest Salve, and Otter Sliding in the Sunshine! The sunshine is back! We began our day at Whatcom Falls last Friday with a fire to warm our bones during the crisp fall morning. The Fox Walkers had the opportunity to practice their fire making skills by batoning wood and collecting dry materials to help keep the fire going. They also enjoyed roasting some apples over the fire once again. This has quickly become a favorite activity amongst this crew! We're putting some Douglas Fir pitch in our Salve too! Our Moon Bird and Running Deer story reflected the theme of getting prepared for forest adventures and being aware of hazards. In this story, Moon Bird and Running Deer were getting ready to go out on an overnight hiking adventure. They took the time to go through their equipment, including a first-aid kit, matches, a compass, a map, water, snacks etc. Once they took off on their adventure, they realized that they left the compass at home. Luckily Running Deer was aware of how to use the sun to determine which way is North, so she shared those skills with Moon Bird. Moon Bird also learned that drinking water straight from the creek without filtering or boiling it first could make him sick. Luckily he didn’t learn that lesson the hard way! Moon Bird and Running Deer’s story inspired our own quest to become more aware of hazards and the ways in which to prepare for any circumstances that the forest presents to us. (The incident with the ground-nesting yellow jackets the week before was a potent reminder that hazards have so much to teach us, and it's very important to be aware of them!). As we wandered, we collected healing plants such as Broadleaf Plantain and Rose Hips, as well as pitch from Douglas Fir, to use for making a Forest Salve. This salve will be added to our first-aid kits, so that the Fox Walkers are prepared for potential hazards such as cuts, bruises or stings while we’re out on our forest adventures! We also observed where the sun was while we wandered, and used these observations to determined which way was North, just as Running Deer did in the story. We eventually made our way to Clay Beach, where we shape-shifted into river otters and slid down a clay “slide”! 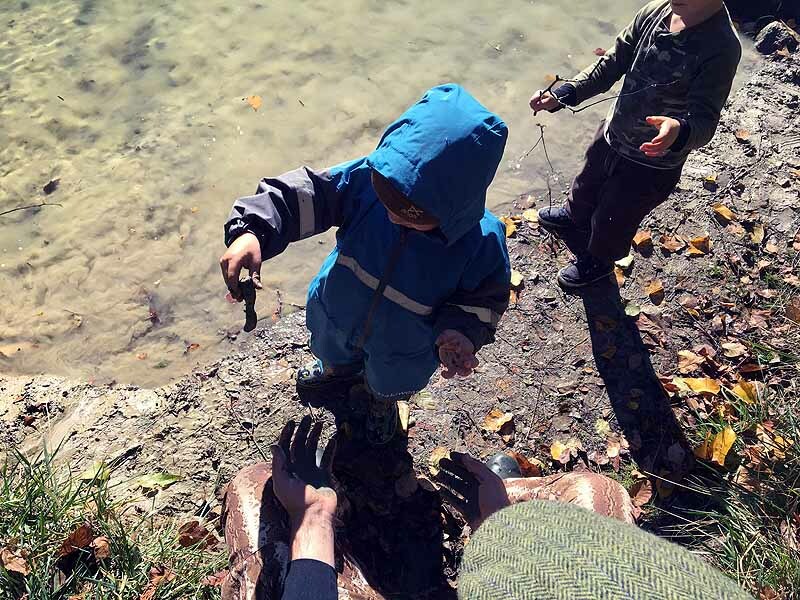 We spent lots of time there, playing with the clay, observing the ducks, looking for real otters in the water, and enjoying the warm sunshine! Lunch was a bit tricky for this crew, as a few of the Fox Walkers were worried about yellow jacket encounters. We sat in the sun along the pond for lunch and made sure that there were no wasp nests around. Occasionally we’d have a curious winged visitor fly by to check out our lunches, so we practiced staying calm. We’re so proud of the Fox Walkers for demonstrating such bravery and resilience as they returned to class last Friday after the yellow jacket incident the week before. We’re grateful to spend our Fridays with such an amazing crew, and we look forward to seeing them again this week! 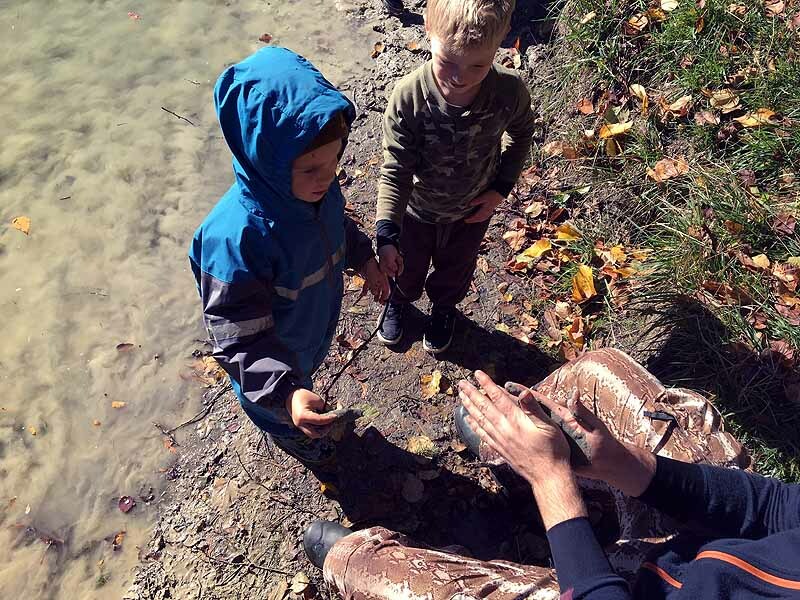 Fox Walkers | Weeks 24 + 25 | Spring Hazards Awareness, Frog & Salamander Eggs! Fire Keepers | Weeks 22 + 23 | Remember Winter? Here comes Spring!